A team new to the league. A team with a backbone of experienced veterans, but also a team with a commitment to young players, led by a coach who wasn’t afraid to put those young players in key positions to perform in important games. A team with a tough, hard-nosed style of play backed by a dominating defense and keeper. A team who—in the front office and in the locker room—recognized the importance of connecting with fans and worked hard to do so. A team that saw that commitment returned with a level of support by those fans that was a revelation to the league. A team that, against the expectations of most, found itself in the league playoffs. 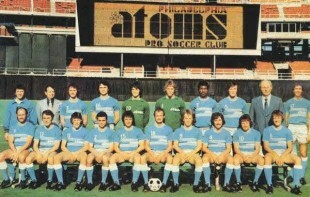 Some 38 years ago, a Philadelphia soccer team took the American soccer scene by storm. That team was the Philadelphia Atoms. Philadelphia is no stranger to championships in American professional soccer. In the first incarnation of the American Soccer League, Bethlehem Steel won two championships, first playing as the Philadelphia Field Club in 1921-22 in the league’s inaugural year and then under their original name in 1926-27. Amid an atmosphere of internal squabbling and breakaway leagues that was so rife with conflict and ill-will that it is referred to as the American Soccer Wars, ASL I folded in the spring of 1933. ASL II was up and running by the fall of 1933 and Philadelphia teams would feature heavily in the roll of champions. Formed from the Philadelphia German Rifle Club in the 1920s and originally known as First German SC, the Philadelphia German Americans won their first ASL championship in 1934-35 before winning again as the Philadelphia Americans in 1941-42, holding the title again from 1944 through 1948, and winning again in the 1951-52 season. That period of dominance was complemented by the Philadelphia Nationals, who won the title in 1948 through 1951—when they gave it up to Philadelphia Americans—before reclaiming the championship in the 1952-53 season. Philadelphia would be without an ASL Championship for only one year after the Nats win in 1953. After being bought by the owner of a Philadelphia-area trucking company, the Philadelphia Americans won the ASL championship again as the Uhrik Truckers in 1954-55 and 1955-56. The 1960s saw the rise of Ukrainian Nationals, winners from the 1960-61 season through the 1963-64 season. They won the title again in the 1967-68 season before topping off nearly a decade of dominance with a championship as the Philadelphia Ukrainians in 1970. By that time, the ASL was more or less a semi-professional league and the newly-formed North American Soccer League was moving to become the big player on the US professional soccer scene. Neither league would survive later past 1984. 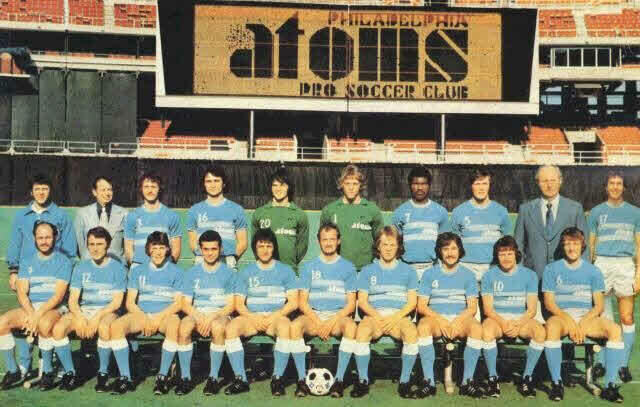 The Philadelphia Atoms joined the NASL in 1973, bringing the league roster up to nine teams divided into three divisions, the Eastern Division, of which Philadelphia was a member along with New York Cosmos, the Northern Division and the Southern Division. The Atoms were coached by Al Miller, a former two-time All-American at East Stroudsberg State who was coaching at New York’s Hartwick College before agreeing to lead the team. While Miller would pepper his lineup with veteran British players such as Andy “The Flea” Provan, Jim Fryatt, and Chris Dunleavy from lower division club Southport FC as well as future Liverpool boss Roy Evans, what caught people’s attention, and caused many a skeptic to voice doubt, was Miller’s willingness to use young American players. Miller made his intentions clear when he selected Ridley Park-native Bob Rigby, now a commentator on Union game broadcasts, as his first round draft pick. Aided by a defense nicknamed the “No Goal Patrol,” Rigby would set a league goals allowed record of 0.62 in the Atoms’ first year. The local connections did not stop with Rigby. Trenton-born Bobby Smith, who would go on to a successful carer with the Cosmos, joined the squad. Barry Barto had grown up in Philadelphia and was coached at Philadelphia Textile by former Ukrainian National player and future Hall of Fame member Walt Chyzowych. University of Pennsylvania product Stan Startzell came on board, as did Charles Duccilli, who had graduated from Germantown High School before setting the record for most goals scored at Temple University and becoming the ASL’s Philadelphia Spartans leading scorer in 1971. Casey Bahr, fresh out of a three year stint in the Navy after graduating from the Naval Academy and son of the legendary Walt Bahr, was also signed. The first Atoms game was on the road against St. Louis Stars. Like Philadelphia, St. Louis was a longtime hotbed of American soccer. And like the Atoms, the Stars roster featured many American players. It was an inauspicious debut for the visitors, who lost 1–0 in front of some 6,782 spectators. Concerns about whether the Atoms would be any good aside, many wondered if teams filled with Americans would be able to draw fans: with the exception of the Stars and Atoms, only 19 Americans were on the rosters of the other seven NASL teams. The Atoms answered the skeptics in their home debut in front of 21,700 fans at Veteran’s Stadium, setting a league attendance record. The match was against Dallas Tornado, NASL champions in 1971. Though the game ended as a scoreless draw, the Atoms had shown they could play with the league’s best. The team worked hard off the field to make themselves accessible to the fans. On the field, they worked even harder, playing a tough, hard-nosed style that fit right in with Philadelphia’s sport culture. And the Atoms were good. After that first loss in the opener, the team went on a 13-game unbeaten streak, losing only one more game for a 9–2–8 record. Ridley Park’s own Bob Rigby, the first soccer player featured on a Sports Illustrated cover, September 3, 1973. The Atom’s record gave them the Eastern Division ticket in the semifinals, where they would face Northern Division champions Toronto Metros. Dallas claimed the Southern Division title and, because their 11–4–4 record was the league’s best, they would face fourth best record and wild card holders New York in the other semifinal game. On August 15, 1973, Dallas squeaked by New York 1–0 to advance to the final. Having beaten New York to advance to the finals, and with the better overall record, Dallas got to pick the date of the final. With the start of the English football season looming, they chose August 25, knowing that several key Atoms players would by then have to be back with their home teams. While Provan and Fryatt would be gone—between them they had 18 goals and nine assists—Dunleavy, the leader of the Goal Patrol, was suspended for the first two games of the English season and would be available. Miller was required to make changes to his lineup as a result of the absence of such key players. One change was starting the Philadelphia-born and University of Pennsylvania alumni Bill Straub. Straub, a midseason acquisition from Montreal Olympique and a defender who had yet to play a single minute for the Atoms, was started as a forward. From the start Philadelphia was in charge. Most of the first half was played in the Dallas end of the field. The rest of it was in midfield. The shots Dallas got at Rigby, in the Philadelphia goal, came seldom and they were puny. 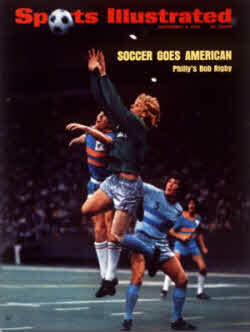 For all his jumping ability and his advantage in size, [NASL Rookie of the Year Kyle Rote Jr.] found Dunleavy wrapped around him like an overcoat. The Atoms saw their first breakthrough 20 minutes into the second half. Attempting to clear a dangerous pass, Dallas defender John Best, formerly of the ASL club Philadelphia Spartans, mishit the ball into his own net for an own goal. With less than five minutes to go in the game, Roy Evans crossed the ball in front of the Dallas goal. Straub headed it into the net to make it 2–0 and all that was left was for the final whistle to be blown. With the win the Philadelphia Atoms became the first expansion team to win a championship in its first year in any American professional sport. It just may have taken a little longer than expected for that future to arrive. The franchise reappeared in 1978 as the Philadelphia Fury, back by a group of investors that included Rick Wakeman, Peter Frampton and Paul Simon. Despite having a 12–18 record (by now the league had done away with ties), the Fury made it to first round of the playoffs. They were promptly dispatched by Detroit Express 1–0. In their second year, the Fury finished with an even worse record of 10–20. Still, they made the playoffs where, against all expectation, they defeated the American Conference Western Division champion Houston Hurricane, winning each game of the two-game series 2–1. The Fury advanced to the Conference semifinals where they were defeated 2–3 and 0–1 by Tampa Bay Rowdies. Tampa Bay would go on to the Soccer Bowl championship game, losing to Vancouver Whitecaps 1–2. The next year, the Fury would go on to become the Montreal Manic. Philadelphia soccer fans would have to wait 30 years for the return of professional soccer to the city. Check out our two-part history of the Philadelphia Atoms: Part One. Part Two. where are the philadelphia spartans?? ?